Cabinet ministers holding shares in any firm which wins government concessions can keep their ministerial posts if they were acquired before entering the cabinet, according to Constitution Drafting Committee chairman Meechai Ruchupan. Mr Meechai cited a Supreme Court ruling to that effect. He was responding to a query on whether Education Minister Teerakiat Jareonsettasin -- who reportedly has 5,000 shares in the Siam Cement Group, which won contracts for government projects -- can continue serving in the cabinet. Dr Teerakiat, who recently criticised Deputy Prime Minister Prawit Wongsuwon over his possession of luxury wristwatches, may himself come under National Anti-Corruption Commission (NACC) scrutiny for his so-called "concession shares". Pheu Thai Party's legal expert Ruangkrai Leekitwattana said he had reviewed Dr Teerakiat's assets declaration made to the NACC and found the 5,000 shares could put his cabinet post in danger if the issue went before the Constitutional Court for interpretation. Mr Meechai explained Thursday the Supreme Court has previously issued a ruling which allows a cabinet member holding concession shares to keep a ministerial post if they were bought before the minister assumed his cabinet seat. However, he said that in principle, a cabinet minister must not hold a significant amount of concession shares that would enable him or her to influence the operation of the firm. "If there are not that many, it shouldn't be a problem," he said. But once a minister takes office, he or she cannot acquire any more concession shares as it would constitute a conflict of interest. Mr Meechai refused to comment further on Dr Teerakiat's case, saying he had no information, adding the share issue must be investigated by a relevant agency. Under the current constitution, a cabinet minister under no circumstances can possess concession shares during their ministerial tenure. Dr Teerakiat, meanwhile, said he was prepared to be probed by the NACC if the issue is raised with the commission. He added the Council of State, the government's legal arm, had declared him in the clear. "Let the NACC investigation run its course. Other cabinet ministers are also subject to probes on a similar issue," the education minister said. On Tuesday, the NACC announced that if and when it received Mr Ruangkrait's petition against Dr Teerakiat, it would form a probe team. 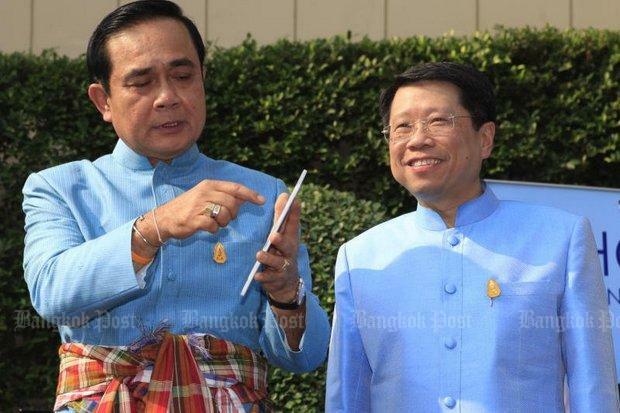 Deputy Prime Minister Wissanu Krea-ngam added confusion to the issue Thursday by saying it would be the Election Commission (EC) that decides whether Dr Teerakiat keeps or loses his cabinet post. He said any query about a minister's ownership of concession shares is handled by the EC. The NACC deals with petitions related to cabinet members owning shares in non-concessionaire firms. The law bans ministers possessing more than 5% of these shares. "There's a distinction between which agencies handle what petition regarding a ministers' holding of shares in concessionaire and non-concessionaire firms," he said.